I was introduced to the amazing Bourbon & Boweties brand in December by my brother's girlfriend. The brand specializes in bangles, more specifically wire bracelets with beautiful stones. I fell in love with them as soon as I saw them because they're so fun and unique, but still super chic. So far, I have four bangles - sherbet orange, teal, red and purple - but I'm looking to expand my collection even further (hopefully this weekend when I go back to Tampa!). The bangles usually range from $28-$48 depending on where you purchase them. Most of their items are only available via boutiques and some online stores, but I think they're working to start selling from their own website. The brand is still relatively new, but it's definitely growing super fast! You can look up local retailers on the Bourbon & Boweties website. You can wear one at a time or create an entire cohesive stack. I love how versatile they are and I've already had a lot of compliments on them. They're chunky and gaudy, but amazing! Have you heard of Bourbon & Boweties? What's your favorite new accessory? wow i love all of those! Wow so cool and stylish! Love these bangles! Nice post! I Love! 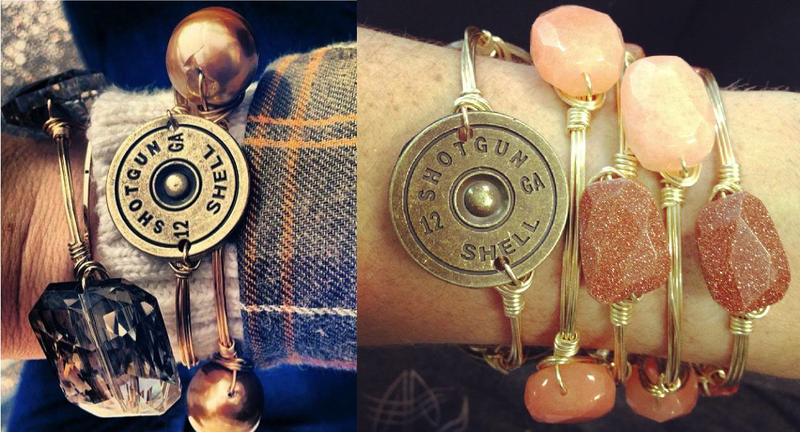 Especially the shotgun shell bracelet! What an awesome piece to add to an arm party!